Wowza! Harry Potter’s Dad is in the house! – An absolute pleasure was to have the famous Adrian Rawlings record with us at Engine7 studio. Known best for his role as James Potter – Harry Potter’s Dad, in the blockbuster Harry Potter movies, and for staring inward winning dramas like Silent Witness, and recently Hard Sun. Adrian is currently up north directing his very own award-winning play “Good People” starting Thursday 1st March until Saturday 24th 7:30pm & 2:30pm at Beverley’s The East Riding Theatre. You can find more information here. Anyway, what was Adrian Rawlings doing at Engine7 you might ask. Well, if you didn’t know he’s also a well-established voice actor too! 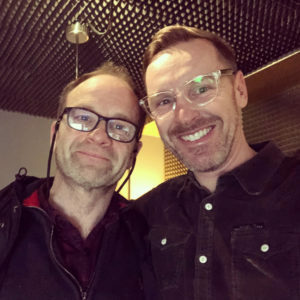 Whenever Adrian is up here in Yorkshire we help him stay connected to London studios by linking up live sessions via Source Connect, this recording was for Harringtons who sponsor Ben Fogle’s “Return To The Wild” on Channel 5. The directors listened in and we recorded the takes at our end into Pro Tools then dispatched shortly afterward as a safety backup. We do love a good link up with fantastic talent like Adrian!